If you are planning to go for a thru-hike or a quick weekend outing, you may want to have a good lightweight bag for you. It will ensure the security and provide enough room to store your necessary stuff. Besides that, it also helps you to travel more kilometers with less energy. Nowadays the outdoor industry prefers to make lightweight bags so that the travelers can use these bags for both long-distance hiking and short trip as well. Again, if you choose to carry a poorly designed or low-quality bag, it can completely ruin your outing and create the worst moment of hiking. Savvy travelers won’t let that happen at all and especially when it is about bags which are going everywhere with them. So, you need to be wise enough at the time of selecting the best hiking bag. If you need any suggestion, then we can recommend you to check Maxpedition Fliegerduffel Adventure Bag. You can wear this adventure bag by hand, or with a shoulder strap. You may look at the features in details. Most lightweight bags have one main compartment for storing the majority of your stuff. That’s the essential storage you need. This bag also has the same storage capacity like other superior quality bags. In the main room, you can keep your climbing equipment such as rope, anchor whipping, ascender devices, and many more necessary things. This area will provide you 2300 cubic inches of cargo space with the tie-down strap which is enough for any traveler. Plenty of pockets will provide you extra storage facility. You will get a top exterior sleeve pocket, two external slip pockets, and two internal mesh pockets to store small gears that you can easily use these gears when you need. In the top exterior of this bag you will find a GPS holder, and of course, it is not a pocket. Shoulder straps help you to hold a significant amount of your pack weight. This backpack features a 2-inch adjustable shoulder strap which is padded and also has concealable backpack straps. Therefore, you can carry this bag on your shoulder to avoid odd pressure. If you don’t want to take this bag by your shoulder, then there is one top padded handle, and one bottom handles to carry it by hand. Sternum strap is included to give you the option to connect your shoulder straps across your chest for a more secure feel. It features PALS attachment webbing on top, bottom, and both sides. YKK high strength zippers and zipper tracks ensure the security of your gears. This adventure bag is made of lightweight ballistic nylon along with the triple coat of polyurethane that makes the bag durable. You may found it little hard to zip the zipper. 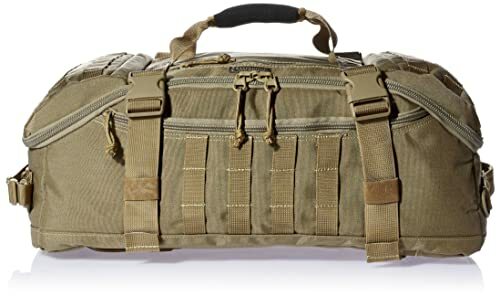 This is an exciting duffel bag that you can use for multi-purposes. Despite being smaller, it can give you enough storage facility. This is a unique travel bag which is appropriately sized to carry-on luggage dimensions. However, we have described all the features of this backpack and hope you will find it suitable. This is one of the best adventure bags that you can select for your next adventure.